As the Summer progresses, a large amount of people living in Ireland will be traveling to Spain for holidays. The adventurous among us may choose to go to the green and mild weather northern Spain and try the popular ‘Camino’ walk to the Galician city of Santiago de Compostela on the North Western corner of the country. Many of us may prefer the sunny beaches on the Eastern and Southern Mediterranean coasts or the beautiful Balearic and Canary Islands. Throughout the year thousands of us, enjoy short weekend breaks to the amazing cities of Madrid, Barcelona, Seville, etc. But not just transient visits… a large number of lucky people in Ireland with access to permanent housing in different areas of Spain, regularly enjoy the charms of this Mediterranean country. The level of popularity of Spain as a holiday and permanent residence destinations has steadily increased in recent years in Ireland. With this, the demand for fast, reliable and competitive parcel transport between the two countries has also increased. Among our Worldwide International Delivery Service, parcel delivery to and from Spain is one of Deadline’s specialties. 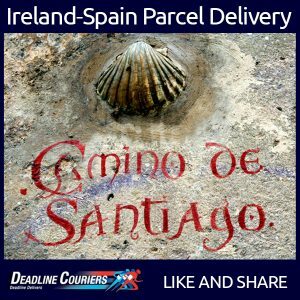 Deadline Couriers can arrange export and import of envelopes, parcels, furniture, etc, door to door between any city in Ireland and Spain. We can also organise Urgent and Express Deliveries as well as Next Day Parcel Delivery to and from selected destinations, all availing of our Computerised Booking and Track & Trace system.